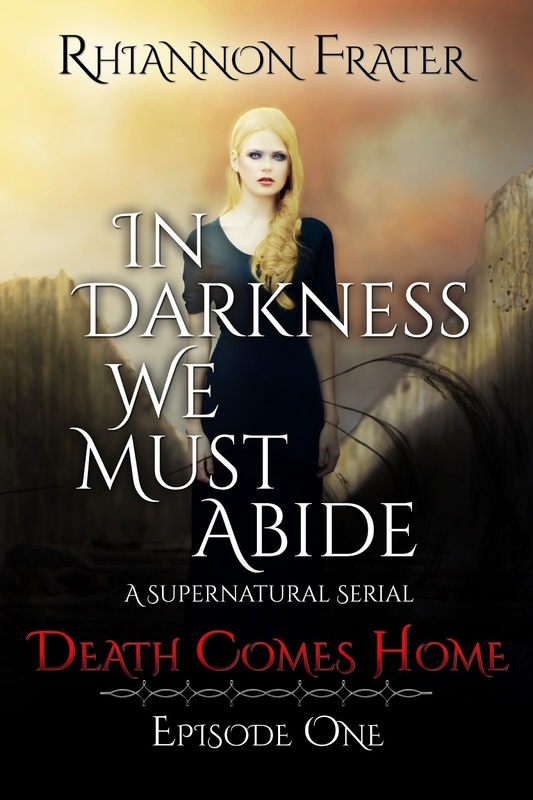 Writer-friend Rhiannon Frater has also launched a serial recently, so we sat down for a little chat about writing serials, pricing them, and how writing a serial is very different than writing a novel. ENTER TO WIN the first three episodes of each of their serials at the end of the post! Sue: You would think we got together in a dark room and concocted a plan to release serials at the same time! Your In Darkness We Must Abide serial is neck-and-neck with my Debt Collector serial in their release schedules! I pre-wrote the first four episodes before I started releasing – I’m working on episode six right now, with a planned nine altogether. That way I can have a reasonable every-two-weeks release schedule while still writing the series as-I-go. What’s your release schedule look like? Are your episodes prewritten? Rhiannon: I did find it amusing that we seemed to be of the same mind about serials. I was really surprised when I saw you were about to release about the same time I was. But great minds think alike! My serial is actually an old novel that I trunked long ago because I had no clue how to submit my novel for publication and did it all wrong. The local library had horribly outdated information and I lived in a very small town in Texas, so it was a disaster when I subbed to publishers. I was so soundly rejected, I tossed the book into the back of my mind and locked the file away on my hard drive. Last year I stumbled across the novel and decided to take a peek at it. As I was reviewing the novel and realized a few things. 1) It was enormous-basically the size of about three novels. 2) It was very episodic. I do tend to write cliffhanger endings to chapters, so I shouldn’t have been surprised. 3) With some tweaking it would make a great serial because it was so episodic. The challenge, of course, was making sure each episode actually works as a separate piece and makes for a fulfilling reading experience. My other novels would make horrible serials except for AS THE WORLD DIES. A serial is a completely different creature from a normal novel. Luckily, In Darkness We Must Abide already read like a serial when I started slicing it up. For the In Darkness We Must Abide launch, I wanted to be sure to have at least four episodes “in the can” so to speak. I wanted there to be leeway for any possible delays I might experience from my other writing commitments. (My Tor contract comes first!) The release schedule is two to three weeks depending on factors, but I do announce the next release date at the end of each installment. Sue: *nods throughout your entire answer* I couldn’t agree more that serials are a completely different creature from a normal novel! That episodic storytelling requires a more complete and satisfying experience to the reader than they would get from just a few chapters of a novel. I’m really enjoying the freedom the format gives to dive into details in each episode that maybe would get lost in a novel. I see each one as almost a mini-novel, with themes and characters that are self-contained… even if they flow into the next episode as well. And I love that readers are adventurous enough to try out this new form – I think they’re as pleasantly surprised with the reading as I am with the writing. Ok, let’s talk pricing! Right now I’m sticking with 99cent episodes and $2.99 collections of three episodes. I see your first episode is FREE (go get it right now)! How long do you plan to keep it that way? And how do you plan to price your 5-6 episode omnibus? Rhiannon: I really love the fact that I can further flesh out my original story in a serial because I don’t have to worry about the over all page count (word count). I can write the story as fully as I want without restriction as long as I’m keeping it interesting for the reader. It definitely allows me to go even deeper than I usually would when keeping an eye on my word count. Though the first episode was free on my website, Kobo, and iTunes, it took awhile for Amazon to finally price match and make the Kindle version free. I’m thrilled they finally did so! My goal has always been to have the first episode for free. Readers are still discovering serials, and I can understand the reticence to invest time in one. Making the first episode free allows readers to make a non-monetary investment while deciding if they actually like my writing and the story. My serial may not be for some, while others may love it. Hopefully, those who enjoy the first installment will then buy the subsequent episodes, all of which will be priced at .99. I’m still not certain about the pricing of the actual paperback of the first season. I have yet to make a final decision on whether or not whether I’ll be doing an electronic omnibus for the episodes in the first season, and if I do what the price point will be. I know some people think that serials are a money scheme, but the reality is that the low price point on the installments does not garner a high royalty. If no one reads the installments, the serial doesn’t make any money at all. Yet, serials demand the same attention as a full-length novel. Cover art, editing, promotion, etc. Sue: Yeah, the low royalty on the 99cent episodes made me quiver at first, especially when it came to paying for cover art. But I decided that covers always help people decide to pick up the story, so I went with gorgeous cover art and a top notch cover designer. I’ve considered pulling the individual episodes after the e-collections are available (three sets of three episodes, each about the length of a short novel), but I love the covers too much! And I would like to leave the first episode or two available for sampling anyway, so we’ll see when I get there. Since readers are asking for it (and serials – for me – are all about listening to fans), I recently decided to do a paper edition as well… but not until the end of the nine-episode season. Otherwise, it doesn’t make sense in terms of price. I’m very conscious of making this a high value proposition for my readers – I want them to feel like they’re getting their money’s worth in entertainment for the series. This is one thing that I think serials do really well (if they’re done right) – they deliver a tremendous amount of story and entertainment packed into each episode. There’s a low commitment on the reader end – they try it; if they like it, they come back for more. And the entertainment value builds as the serial progresses, just like a TV season, where you enjoy each episode, but you’re looking forward to the big season finale! As a writer, I’m enjoying the heck out of creating that experience. My next release (Episode 4 – Broken) is April 17th! When is yours? Rhiannon: I’m very lucky to have a publishing team in place for this serial. My husband is creating the covers for the serial. He went to college to study game design, so doing covers is a bit different for him. I personally think he’s doing a great job. The covers have been very well-received. Ashley from BB Designs designed the typgraphy, which is very striking. I loved how she laid out the episode title. I honestly would not have been able to afford to do the serial if not for my husband taking on the covers. Serials are a big money investment when it comes to editing and covers. My hope, of course, is that people will gobble up the serial and spread the word about it. Right now I suspect I will leave the serial for sale in installments and sell paperback omnibuses of the seasons for the diehard dead tree format fans. Of course, I will respond to fan demand and adapt accordingly, but we’ll see how it all plays out. This is all new territory for not only readers, but writers, too. While constructing In Darkness We Must Abide, I’m definitely keeping in mind such shows as Buffy the Vampire Slayer, Being Human (UK), and Breaking Bad. Buffy had filler episodes, but the other series have shorter seasons so there aren’t any detours. I’m trying to create a very intense, in depth, but fully fleshed out reading experience. I want fans of the serial to come away feeling they just saw a great TV show. I’m aiming for a very cinematic feel while being able to indulge in the depth that the written word provides. I have a question for you: Do you feel writing a serial has made you grow as a writer and further develop your voice? Sue: That’s a great question! Everything I write helps me grow as a writer… at least I try to further my skills in each work. This serial in particular is an exploration of my darker side – simply because that’s the story, not because it’s a serial. The format, though, is definitely demanding writing – it’s challenging to let the story that I envision unfold while also staying open to reader feedback along the way. As I mentioned somewhere else, this is the toughest writing I’ve ever loved! Any last topic we haven’t covered? Rhiannon: I believe we have covered everything! It appears we are both agreed that serials are not easy to produce, or a get rich scheme (like some people think it is), but a new way of reaching readers. So far, I’m loving the experience. 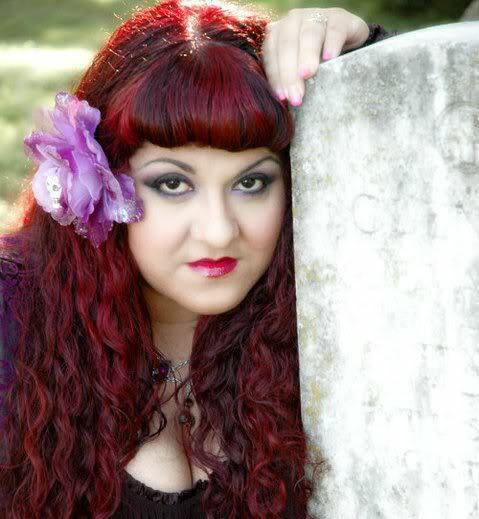 Rhiannon Frater is the award-winning author of the As the World Dies trilogy and several other vampire and zombie books. She publishes both independently and through Tor publishing, and is represented by Hannah Gordon of the Foundry + Literary Media agency. You can find all of Rhiannon’s books here. Susan Kaye Quinn is the author of the bestselling YA SF Mindjack series. 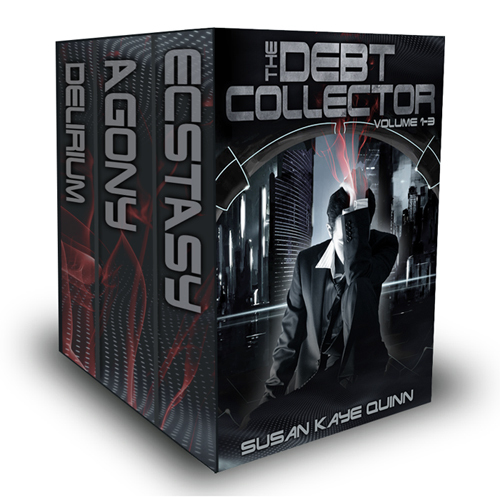 Her new Debt Collector serial is her more grown-up SF. Her steampunk fantasy romance is temporarily on hold while she madly writes episodes to keep Lirium (the titular Debt Collector) happy. Mostly she sits around in her pajamas in awe that she gets make stuff up full-time. You can find all of Susan’s books here. Awesome! Loved reading two gurus' thoughts on serials. 😀 I have one coming the end of April, and I'm nervous AND excited by the prospect! Glad to see that you guys are having such a blast with them. Good luck with your serial! I have to say that I am loving the serial type book. It makes it nice to read along with an episode here and there. The anticipation kills me, but I am still loving it. Gonna check this other one out! Good luck with your serial/novel, however you publish it! And I'm sure Dale will do great work for you! Thanks for stopping by!